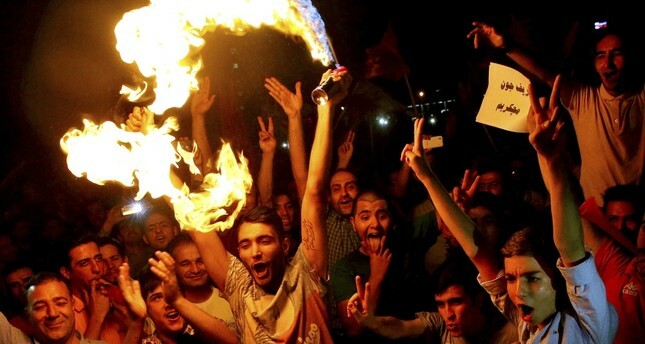 Iranians celebrate following a landmark nuclear deal in Tehran, Iran, July 14, 2015. Since becoming president early last year, Donald Trump has supported Israel and the Gulf’s anti-Iran agenda and has attacked the nuclear deal. The Trump administration has been following a controversial policy toward the Middle East since Donald Trump came to power. While Mr. Trump continues to follow Barack Obama's policy in the Syrian crisis, he inverted and revised U.S. foreign policy toward the Gulf States and Israel. Mr. Obama tried to pursue a moderate policy toward Iran and a balanced policy toward the Gulf and Israel. On the contrary, Mr. Trump has been trying to alienate Iran in the region and punish it. Furthermore, he reversed U.S. foreign policy toward the Gulf and Israel by strongly supporting their aggressive agenda against Iran. Mr. Trump made his first foreign visit to Saudi Arabia and called for polarization in the region. He first created division in the Gulf by telling the Saudis and the Emiratis to punish Qatar for its independent foreign policy. Then, Mr. Trump encouraged these two states and Israel to take action against Iran. I will try to analyze the Trump administration's controversies regarding the Iranian nuclear agreement signed in 2015 between Iran and the five permanent members of the U.N. Security Council plus Germany, a group known as the P5+1. Mr. Trump wants to revise the nuclear deal; otherwise, he declared that he would pull out from the deal and re-impose economic sanctions on Iran. Reviewing the most recent developments, there are three main inconsistencies in Mr. Trump's policy toward Iran's nuclear agreement. First of all, as soon as he came to power, Mr. Trump declared that he would withdraw from the nuclear deal signed by the Obama administration. It was expected that the Trump administration would ask the Iranian government to abide by the agreement. Instead of forcing Iran to comply with the conditions of the agreement, Mr. Trump has been threatening to withdraw the American signature. He unilaterally refused to sign this multilateral agreement, ignoring the position of other signatory states. Thus, Mr. Trump undermined the continuity in state tradition and ignored the national foreign policy trends. Reversing whatever Obama did has many negative implications for U.S. foreign policy. Furthermore, Trump's behavior damages the reliability of the U.S.' commitments to the international community. Second, by ignoring the Israeli nuclear arsenal, the fifth largest nuclear power in the world, the Trump administration is not actually demanding a nuclear-free region. According to the rules set by the Treaty on the Non-Proliferation of Nuclear Weapons (NPT), no state is allowed to develop nuclear weapons. However, neither the U.S. nor any other Western countries have condemned Israel for developing nuclear weapons.Therefore, they lost the moral superiority to ask other regional states not to develop nuclear weapons. On the other hand, Iran fears Israel's nuclear weapons. That is, Israel's access to nuclear weapons forces Iran to have the same deterrent weapons. Third, while opposing the Iranian uranium enrichment process as a threat to regional stability, the Trump administration has been trying to motivate Saudi Arabia to produce nuclear energy and nuclear weapons, if necessary. Saudi Arabia, as one of the biggest buyers of American weapons, asks the Trump administration to provide the necessary technology to produce nuclear weapons. Iran's production of nuclear weapons will force other regional countries, i.e. Saudi Arabia, to produce their own nukes. Saudi intentions and Trump's possible support caused a discussion in American politics. Many American politicians, such as Republican Sen. Bob Corker and Democrat Sen. Edward Markey strongly oppose the transfer of nuclear technology. In conclusion, Trump's policy toward Iran is controversial and many domestic and international actors question the reliability and effectiveness of this conflictual policy. Even European signatories of the nuclear agreement, i.e. the United Kingdom, France and Germany, claim that Trump's policy is frustrating and will not contribute to the solution of the problem. Further polarization will only cause further crises and instability in the Middle East.